I just returned from a visit to Junior’s workshop. 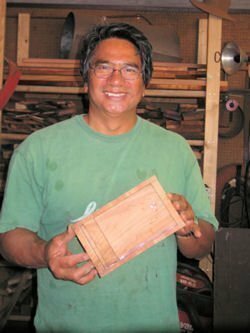 This is a long time friend (we used to paddle canoe at Na Kai ‘Ewalu many moons ago) and master woodworker. When not working at HC&S;, he makes our koa papa hehi, kala’au, lauhala strippers and tapa beaters……..among many other things. His specialty being traditional koa paddles. To see a really cool video about Junior, click here. 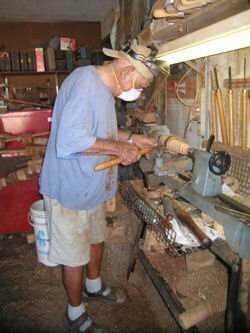 This is Uncle Joe working on koa braclets.If you’re on Maui, you can usually find Junior and Uncle Joe at the Maui Swap Meet in Kahului every Saturday (way in back under the trees). Today’s ‘Olelo No’eau: E ola koa. Live like a koa tree. Live a long time, like a koa tree in the forest.